One can reasonably argue that National Geographic Magazine is the most influential magazine focused on photography, since the untimely demise of Life Magazine. One can also argue that being the most influential comes with the most responsibility. When the photo editor(s) at National Geographic select the one photograph per month from all the submissions to their ‘Your Shot’ community, they have awarded the photographer great honour and respect. I am sure it is an incredibly tough decision for the editors making the decision to publish one particular image over 1000s of others. I sat on a couch in the lobby of a hotel this week, waiting for my room to be ready. I was leafing through the latest National Geographic Magazine. The May 2018 issue. Following stories about Picasso, birds flourishing following the catastrophic meteoric event that caused the extinction of the dinosaurs, and stunning underwater photographs of grouper and sharks, I came to the last photograph. The selection by the Photo Editors from the thousands that submit their work to the website organized by National Geographic under the banner Your Shot…. 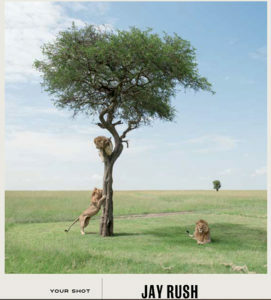 The photograph, which shows three male lions in and around a tree. One lion is in the tree sitting in what looks like a very uncomfortable position in a split of the trunk some 4 meters above the grass floor. A second lion is standing on its hind legs with its front legs gripping the trunk and the third lion is resting in a very regal position, suitable for the front staircase of any large bank, or around the base of Nelson’s Column in Trafalgar Square. The composition is nice. 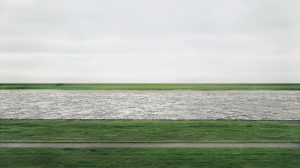 There is great balance, a single tree on the right sits near the horizon line and breaks the horizontal line that separates the plain from the sky. Right at the golden section. A nicely composed photographs. So, I think to myself, why doesn’t it look right? Why does it look like a painting and not a photograph? What is wrong with this picture? The more I look, the more I am bothered by something not quite right. And then I get it. The lion on the left, on his hind legs and the lion lying majestically in the shadow of the tree have the exact same colour palate. The same tonal range. And why is this important? Well, the lion on the left is in the sunshine. The sun on his back. The lion on the right is in the shadow of the tree. Yet, the two lions are exactly the same colour. How can a lion in the sun be the same colour as one in the shade? It can because it is not real. It is impossible. This then begs the question; is the perfectly placed tree in the background fake too? Is the grass really that green? Are the lions real? Is there a tree? Was any of it really there? I don’t know Jay Rush. I don’t know anything about his work, but I do know that nature does not create the same amount of colour saturation in sun and shade and no camera that I have come across exists that can make it so. But computers, ah well, that is a whole other story. They can do anything. If a tree falls in the forest, was it really there? PS: To the Photo Editors at National Geographic: Shame on you! Another famous – and now infamous – photography competition presented by London’s National History Museum admits having awarded a prize to a photograph, which is more than likely fake. 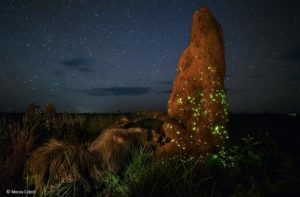 The 2017 edition saw Brazilian Marcio Cabral’s photograph titled ‘The Night Raider’ win the best ‘Wildlife Photographer of the Year’ competition. 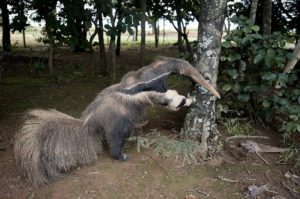 When questioned Marcio Cabral, the ‘photographer’, apparently supplied RAW image files from ‘before’ and ‘after’ the winning shot, but none included the anteater. He did however, provide a ‘witness’, who claims he saw the live anteater. Friends, you just can’t make this stuff up! Some advice to those that run competitions for photography (and not digital art or manipugraphs): Demand the raw file, or the negative from those about to be declared winners. Compare the finished photograph to the raw file or negative. Ensure the image is representative of what was before the photographer at the time the photograph was taken. It is more work, but it saves the competition, catches out the cheats and bad apples, and makes the world a better place! If serious photographers, serious photography editors, serious publishers, serious judges, serious museum goers, serious collectors and serious audiences don’t take a stand, competitions will continue to be put in disrepute, people will stop believing, and the few will continue to ruin it for the many. For someone like me who still shoots film, prints in a darkroom, and likes silver gelatin photographs, this is nothing new, just another nail. 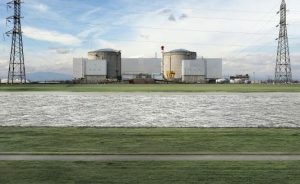 Gursky is a child of the Bernd and Hilla Becher school, two masters who set out to show sameness and differences in buildings and industrial installations, cataloguing and recording them for posterity. In short, the founders of what has become known as The Dusseldorf School. How is it possible that one who shoots with a digital camera and admits to manipulating the digital files, so as to make them more pleasing and interesting to the eye – adding a couple of bends to a race course, or removing a large and unsightly factory from the banks of the Rheine, as in Rheine II – can be the maker of The Encyclopedia of Life. How is it that curators and critics quote and agree with this pretense? How can this graphic artist – I refuse to call him a photographer – even contemplate calling himself the maker of an “Encyclopedia of Life”? It seems to me that yet again, we are having to question everything we see, every image, every movie, every piece of news, because not a single conveyor of knowledge or imagery can be trusted? Is that really the legacy we want to leave for the next generation, or the ones after that, who will never know the truth, because we in the present day knowingly allow it to be altered. Is it photography when what is in the photograph does not exist in real life? Are we getting so accustomed to an alternative reality, where super heroes dominate the silver screen, zombies walk the streets and natural disasters are glorified though CGI, not because it is a great story, but simply because we can. When one can sit at home on the couch and virtually walk through a busy shopping area with a Kalashnikov and try to hit the bad guys, but if you take out an innocent civilian you lose three points. Is this to be our desensitized, pathetic legacy? Do we have to check the raw file from every image printed to see if it is real? Do we have to physically travel to the banks of the Rheine to look across and see the ugly factory to know what is real and what is fake? If Andreas Gursky gets to be the writer and illustrator of the “Encyclopedia of Life”, then it is nothing but a ruse, a badly written screenplay put to life in the form of a huge piece of brightly coloured paper, mounted, framed and carrying a million dollar price tag. One great big lie. 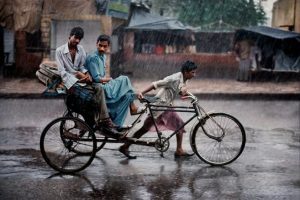 • Last year the famous photographer Steve McCurry was caught having digitally manipulated a number of his photographs. He blamed his ‘team’ (Petapixel.com, May 6th, 2016). But what about his other family, his Magnum family? • Only a few weeks ago, Peter Vik announced he was leaving Magnum Photos, because he refused to sign a new contract with an outside investment group. He left Magnum to protect his freedom, as a photographer (British Journal of Photography, June 15th, 2017). These two news items may have nothing in common at first glance, but they may be symptomatic of trouble at Magnum Photos and perhaps a warning of things to come. I have for many, many years been a strong supporter of the legacy that has led Magnum Photos to be a place for photographic independence, where photographers retain control of their photographs, sold for single use only to media far and wide. When the founders of Magnum came up with the single use policy, it laid the foundation for the livelihoods of many of the best photographers of the past 70 years. The price for this success was of course a certain set of iron-fisted leaders that forced photography in a particular direction. One of the early drivers was Henri Cartier Bresson (HCB). A fiercely independent photographer, who with a substantial family fortune behind him could afford to be selective in his assignments, and who as luck would have it with his first self-assigned project for Magnum Photos struck gold. HCB was in India to photograph Gandhi. As it happened, this was the day before Gandhi was murdered. HCB went on to cover the funeral leaving the world with some very iconic photographs that were sold to newspapers and magazines far and wide. In some ways, this single assignment cemented the name of Magnum Photos and made it what it has been for the past seven decades. HCB was the backbone of Magnum Photos for many, many years. He worked hard at critiquing and schooling superb young photographers like Marc Riboud until he was satisfied that they had mastered the HCB esthetic. Shooting in his image, one might say. But strong personalities have their own challenges. When Kryn Taconis an early Dutch member of Magnum came to Paris after having returned from Algeria, where he had been photographing on the side of independence (and therefore against the French, in the eyes of HCB), Magnum Photos on the specific orders of HCB refused to circulate his photographs through their usual channels, effectively muzzling Taconis. Taconis soon left the collective. I met Kryn Taconis’ widow a few years ago, around 2002, I think. By then she was in her 90s. She showed me a photograph by HCB. A modest size print of Kashmir, from 1947. The inscribed photograph was HCB’s gesture of contrition for having effectively censored Kryn Taconis out of Magnum. He had come to visit, in person, admitting he was wrong to block Taconis’ work, by letting his own personal politics get in the way. He was a dollar short and a couple of decades late. Kryn Taconis had passed away in 1979. In modern times, when Steve McCurry was found to have manipulated his photographs to perfection, he blamed his ‘team’. McCurry made a lame argument that he was not shooting on assignment, and had not supervised sufficiently, etc. Had there been only one of these manipulated photographs, it might have been OK. Write it off to assistant enthusiasm, perhaps? 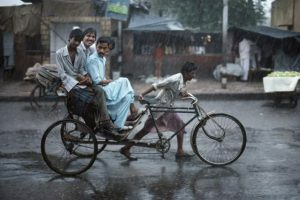 But there are several internet-sleuths, who have uncovered further examples by simply comparing photographs by McCurry that are in circulation on the web. Does this taint all of McCurry’s work? You decide…. When it comes to Steve McCurry, Magnum Photos has chosen to remain virtually silent. It seems that when the big names in photography make mistakes, like HCB with his politics, or Steve McCurry with his digitally perfected colour photographs, there are different rules. HCB may be dead, but I do not think he would be happy about Magnum Photos taking on outside investors, and starting to lose control of the collective he founded. Likewise, had he been alive, I am pretty sure he would have asked Steve McCurry to leave Magnum Photos. But, if Steve McCurry were asked to leave Magnum Photos, what would the new investors say? What would losing a revenue stream from work by what used to be one of the great photojournalists of his time? This may explain the silence from a usually outspoken Martin Parr, who just stepped down as President of Magnum. For all its faults, Magnum Photos may be the last refuge for some of the best photographers in the world, who might otherwise have had to shoot weddings and corporate annual reports to survive. In a world where a cell phone video by an anonymous witness, has replaced professional photojournalism in most media outlets, it is tough to be a photojournalist. I worry…. If books are anything to go by, Magnum Photos is doing everything it can to invent new revenue streams. There is a TV series in development, and I understand that there are discussions about how best to leverage the brand. With the new investors in place, who will be looking for a return on their investment, can coasters and coffee mugs be far behind? AND in refusing to tackle the McCurry issue, has Magnum opened the door to doubt about authenticity, and legitimacy of itself, and its collective of great photographers? Images are borrowed from the web and are attributed to Steve McCurry, and are for illustration purposes only, no rights owned or implied. It is the end of January, and we have seen the dawn of a new era in the United States. There is a new term added to the lingua franca, the alternative fact. Perhaps the digitally modified photograph is an alternative fact? I recently got an email message from a reputable interior design magazine that I subscribe to. Under the title: “20 reasons to travel to the Greek Islands”, the photo below was number 1 of 20. Someone was clearly not paying attention. 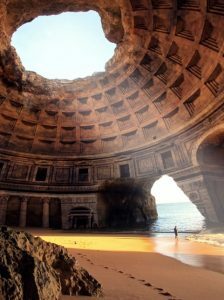 The interior of the Pantheon in Rome and a beach somewhere, fused together to make it look like you can swim off the edge of an old Greek temple? The coffered, domed ceiling and oculus of the Pantheon is quite particular and, if you have been there, you don’t forget. So, yes, I recognized the fraud and who really cares? But had I not, and was I looking forward to my next summer vacation, I could have spent hours searching high and low for the beach with the ruin. Who is responsible? The Magazine? the person who created the fraud? I grew up believing in what I saw on the printed page, or on TV. But, times change. I cannot imagine that I am the only one to become so jaded, that I immediately question every image I see. So, so sad!